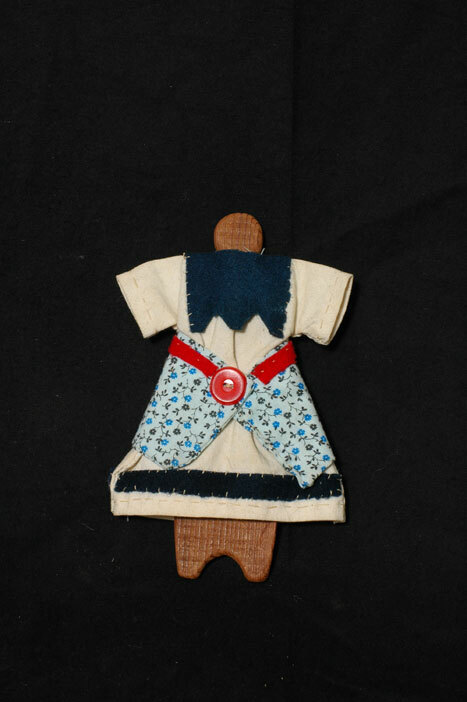 The digital images of selected Omaha material culture seen here and throughout the UNL Omaha Language website were photographed by Matt Pearson at the UNL Center for Digital Research in the Humanities, or as otherwise noted. All items included here are from the Awakuni-Swetland family, or as otherwise noted. The selection of items to be photographed was based upon the desire to share a glimpse of the stunningly beautiful Omaha material culture world. Many of the objects are replicas of heirloom late 19 th and early 20th century Omaha pieces now housed in museum collections around the world. Objects that are used primarily for ritual purposes have been intentionally omitted out of respect for the Omaha people. 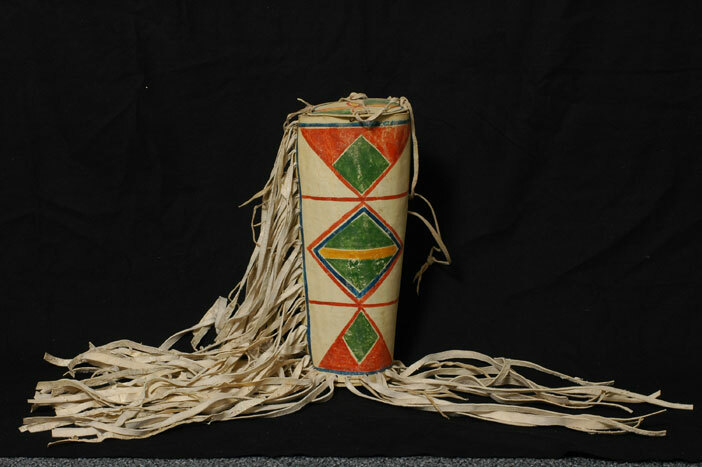 More images of Omaha material culture can be viewed on-line at the Omaha Indian Heritage Project at the University of Nebraska, including links to other on-line Omaha images from around the world. 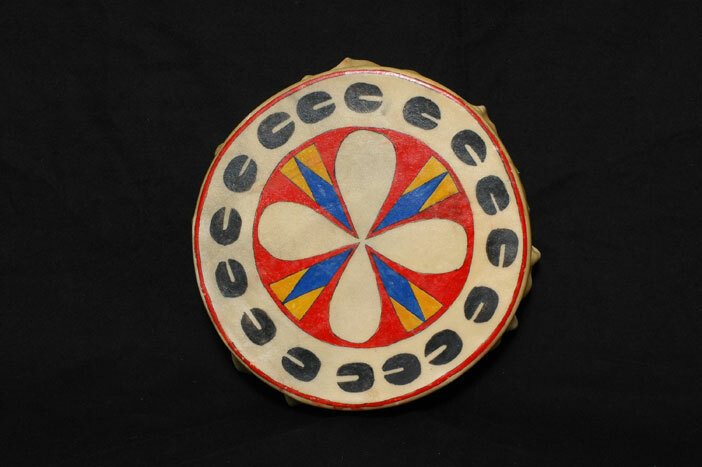 kúge, or kúge zhinga, or thexe gaku bthaska. kuge 'drum', zhinga 'small', thexe 'kettle', gaku, 'to tap', bthaska 'flat'. Horse rawhide over wood frame. 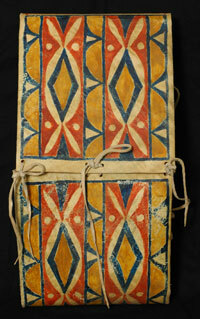 Watercolor motif derived from Omaha rawhide parfleche designs with buffalo hoof prints around perimeter. Made for Keali'I Swetland. Horse rawhide over wood frame. Watercolor motif derived from Omaha rawhide parfleche designs with buffalo hoof prints around perimeter. Made for Micah Swetland. tehe, or tehe sabe. te 'buffalo', he 'horn', sabe 'black'. Gift of Clara Lawson to the UNL Omaha language class in 2005. 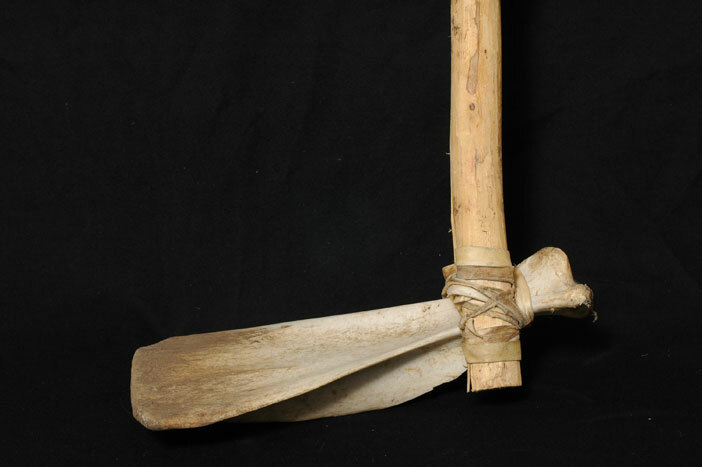 Buffalo horn spoons were common throughout the Great Plains. 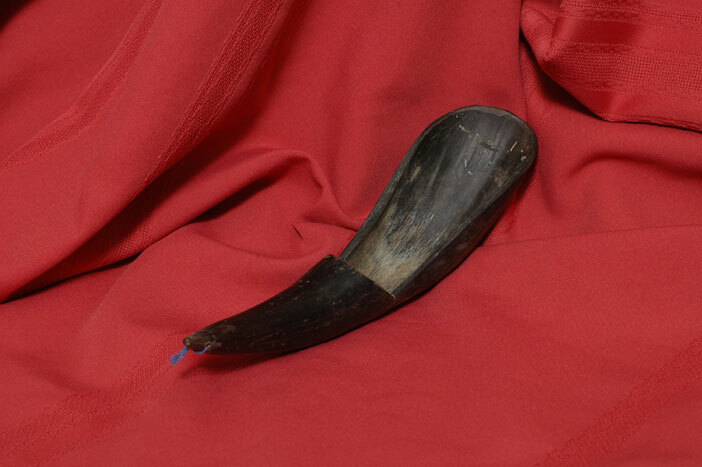 For certain Omaha clans, the buffalo horns, head meat, and tongue were ritually taboo. In those cases, a carved wooden spoon would be used when eating. Two-needle appliqué beadwork on wool with satin ribbon binding. 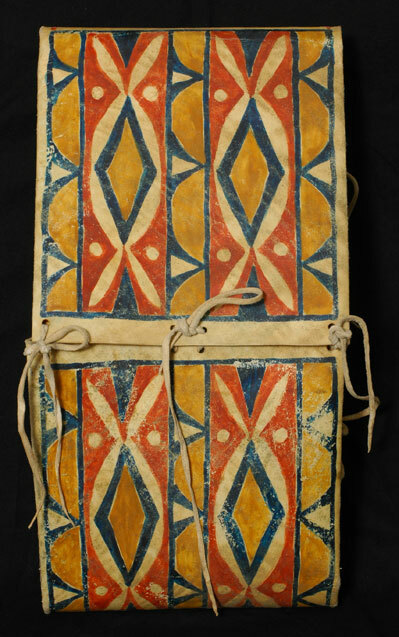 Adapted from an Omaha breechcloth in the collections of the Phoebe A. Hearst Museum of Anthropology, University of California-Berkeley. Awakuni-Swetland. Two-needle appliqué beadwork on wool with satin ribbon binding. 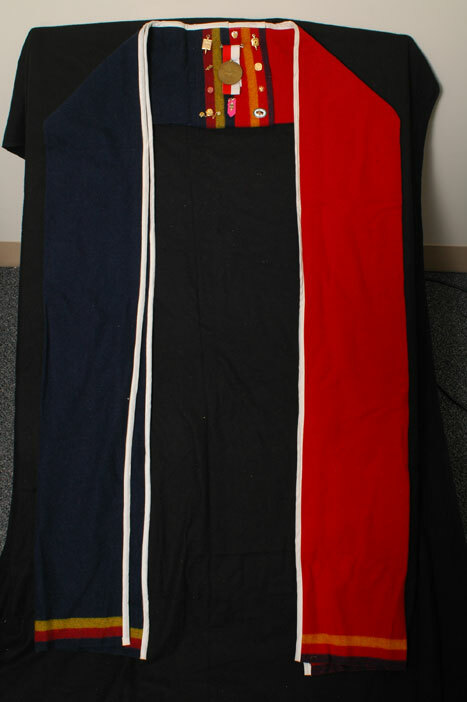 Adapted from an Omaha breechcloth collected by Margaret Mead on the Omaha Reservation, 1930. In the collections of the American Museum of Natural History, New York. Awakuni-Swetland. Two-needle appliqué beadwork on wool with satin ribbon binding. 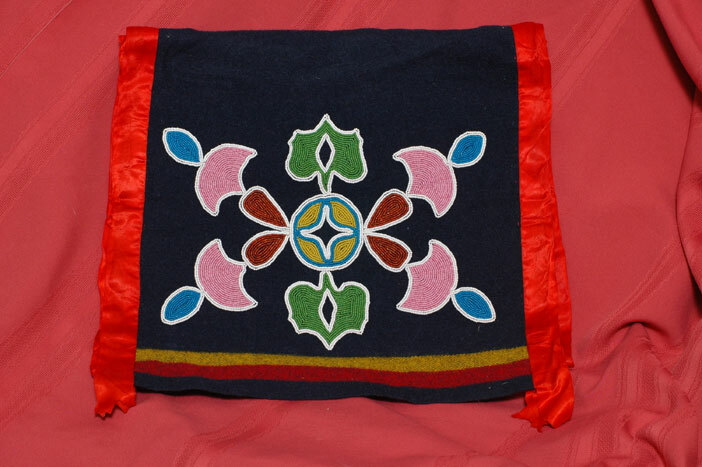 Adapted from an Omaha breechcloth worn by Charlie Wolf at the Macy, Nebraska Powwow, September 1922. A black and white photograph is in the collections of the Nebraska State Historical Society. Awakuni-Swetland. Beef rawhide and watercolor. Adapted from Omaha examples in museum collections. B & K Brewer. hinbe or hinbe ukethin. hinbe 'shoe', ukethin 'common'. Smoked moose leather, beads, yarn. Adapted from Omaha examples in the collections. 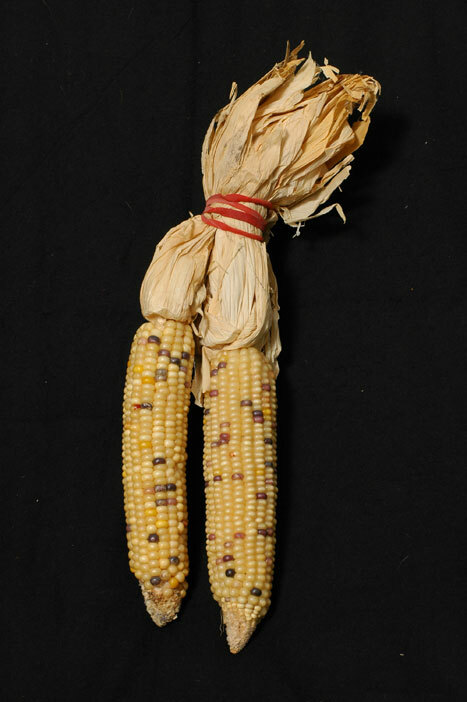 of collections of the Phoebe A. Hearst Museum of Anthropology, University of California-Berkeley. Awakuni-Swetland. Glass beads, yarn. Adapted from Omaha garters worn for dances and ceremony, transferred from the collections of the Peabody Museum to the Omaha Tribe. Awakuni-Swetland. Beef shoulder blade bone, willow handle, rawhide binding. Used by students during the summer 2005 Native American Horticulture Project (Indian garden) for planting heritage varieties of Indian corn, squash, watermelon, and beans. Awakuni-Swetland. shíngazhinga waséson. shinga from nikashi nga 'person', zhinga 'small', shíngazhinga 'baby', waséson 'plaster, clay'. Buffalo rib, domestic goose feathers. 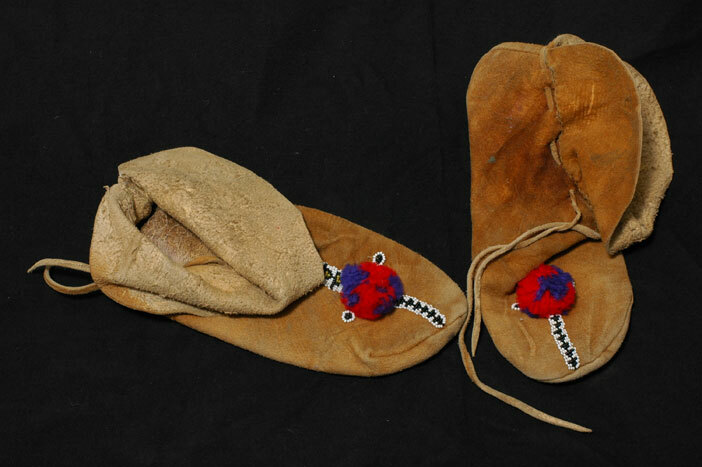 A common winter game played on ice or packed snow by Native people throughout the Great Plains. Awakuni-Swetland. wahí wégasapi. wahí 'bone', wégasapi 'to whip with'. Elk antler, plaited leather, wood. Adapted from Omaha examples in museum collections. Awakuni-Swetland. hínska ipíthage. hínska 'bead', ipíthage 'belt'. Beads, linen thread, wool yarn. 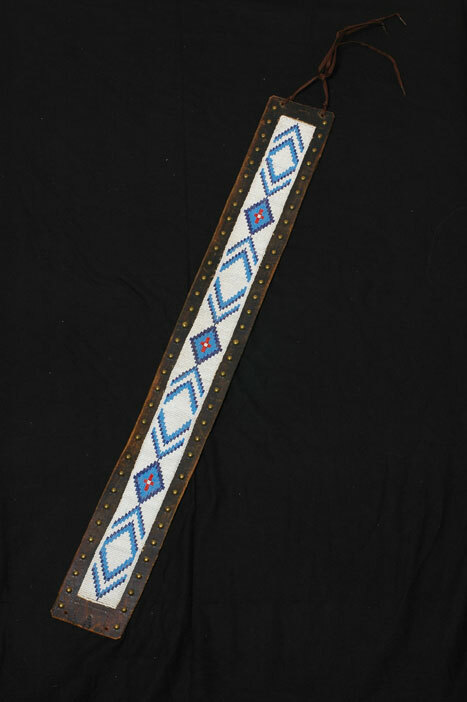 Adapted from an Omaha belt collected on the Omaha Reservation, circa 1930, and in the collections of the Chicago Field Museum. 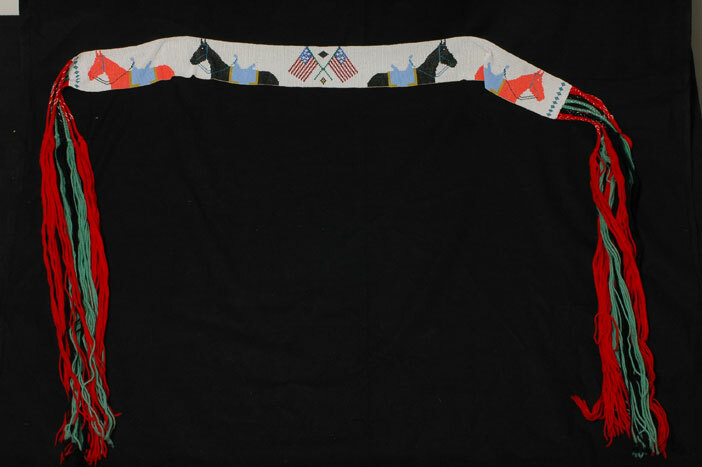 The treatment of the horses and flags is reminiscent of examples from the Osage Tribal Museum, Pawhuska, Oklahoma. Awakuni-Swetland. núsi áxthade úzhiha. úzhi 'to contain', ha 'hide or skin', úzhiha, 'bag'. Beads, wool and cotton cloth, yarn, linen thread. Adapted from an Omaha example in the collections of the Volkerkunde Museum in Berlin, Germany. 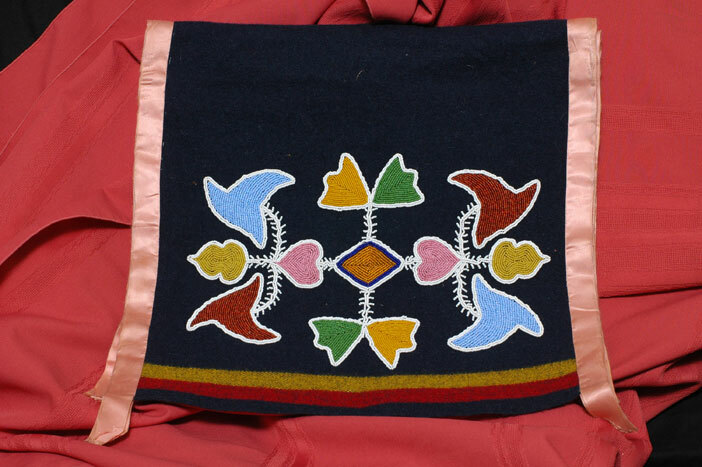 The beadwork is produced using a two-needle method. Awakuni-Swetland. kónsi or kónsi ge. kónde 'plum', si 'seed', ge 'scattered'. 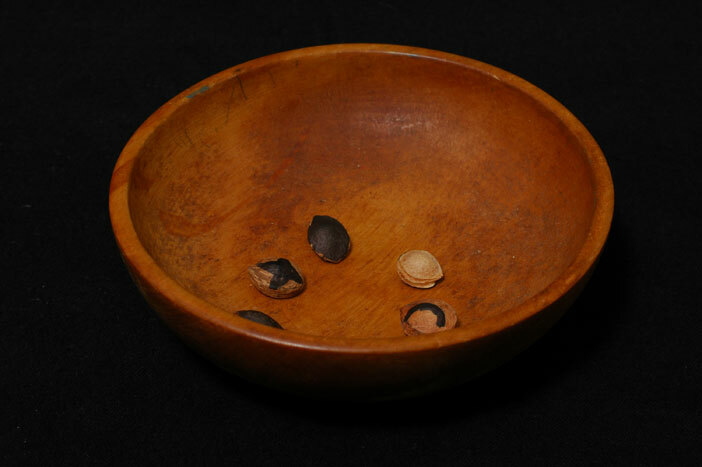 Wild plum seeds marked with ink, wooden bowl. Adapted from Omaha examples in museum collections. The game was played by women, often for wagers. Awakuni-Swetland. Horse rawhide, watercolor, leather ties. Adapted from Omaha examples in museum collections. 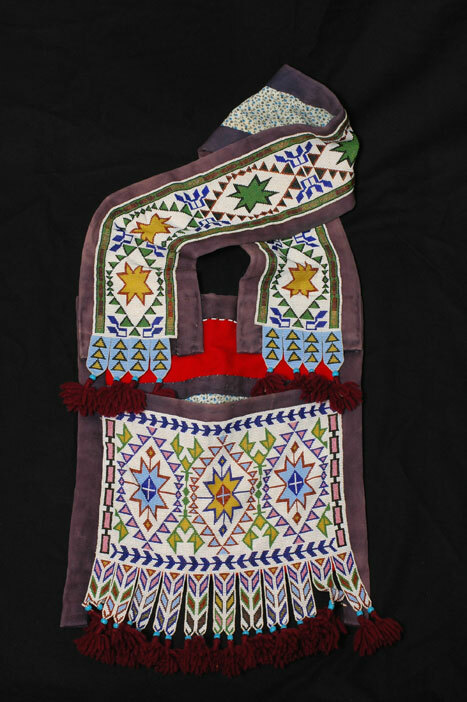 The expandable container was used to carry dried foods, medicinal plants, ritual objects, and personal clothing. It was often made in matched pairs for balancing the load on a horse. B & K Brewer. Horse rawhide, watercolor, leather ties. Adapted from examples in museum collections from various Great Plains tribes. The design is adapted from other Omaha parfleche. The lidded container was often associated with the storage of medicinal plants and ritual objects. B & K Brewer. Horse rawhide, watercolor, leather ties. 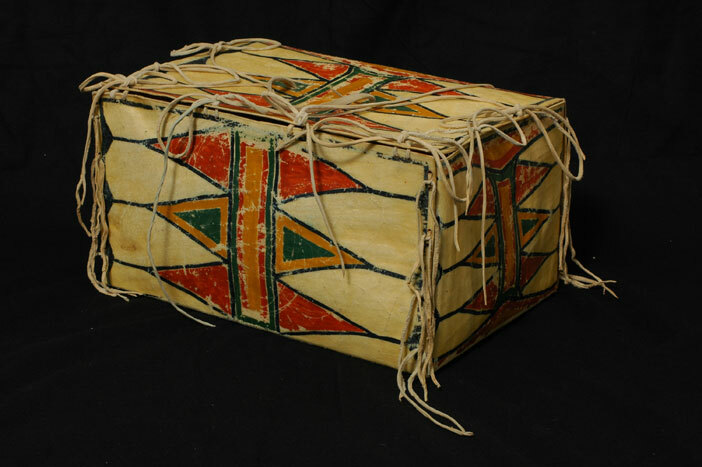 Adapted from a folded trunk attributed to the Omaha in a museum collection. The box shape may be a native adaptation of Euro-American boxes and trunks available in the early reservation period. B & K Brewer. tahinwagthon. ta from taxti 'deer', hín 'fur or body hair', wagthon 'badge'. Porcupine guard hair, dyed deer tail hair. Previously a warrior society emblem, now commonly worn by males of all ages. Attached to the head by threading a small braid of hair through the central hole and an overlaying flat bone/antler hair spreader. Used by Hollis Dawes Stabler as a youth. This roach was given to Mark Awakuni-Swetland by the father, Hollis Dorion Stabler, in 2005. Gabardine wool, fringe, silk ribbon work. A common attire for women entering the dance arena. Worn around the shoulders, or folded and draped over the right arm. 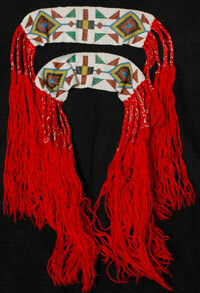 The strip of ribbon work comes from the Osage Tribal Museum, Pawhuska, Oklahoma. It was added to the cloth. Fringes were embellished with a second row of knots for Donna Awakuni-Swetland. Brain-tanned deer hide, horse hair, human hair, water color. 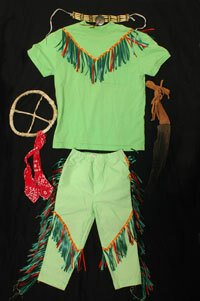 Adapted from nearly identical Omaha leggings in the Phoebe A. Hearst Museum of Anthropology, University of California-Berkeley and the Joslyn Art Museum, Omaha, Nebraska. 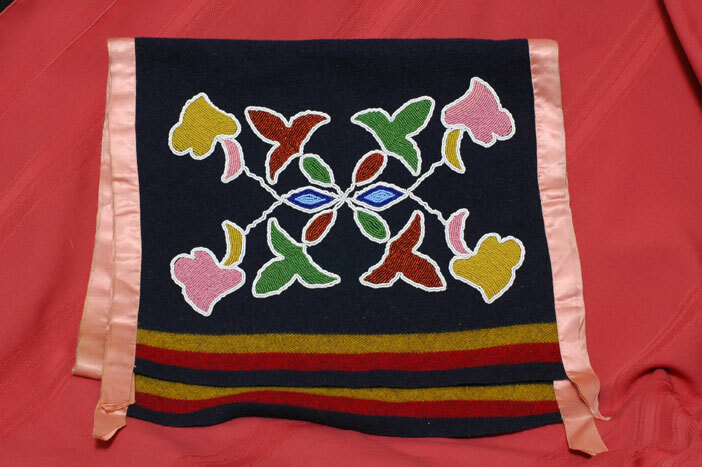 These are embellished leggings worn for dances and ceremony. 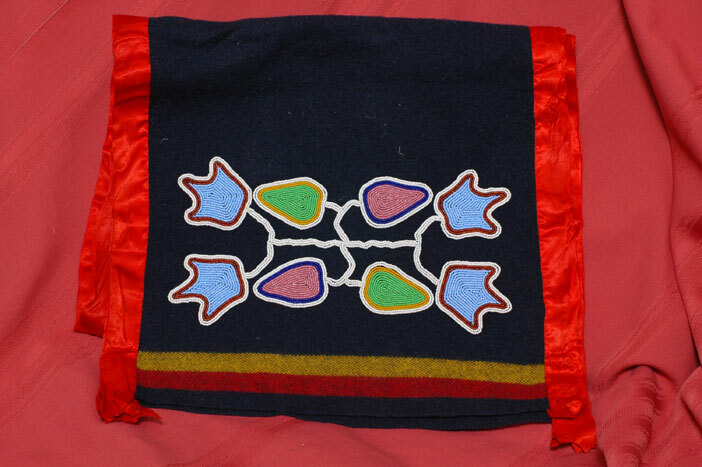 The most notable difference between the two museum examples is in the design on the beadwork strip. This pair uses the design found on the Joslyn leggings. Awakuni-Swetland. Beads, leather, cotton thread. 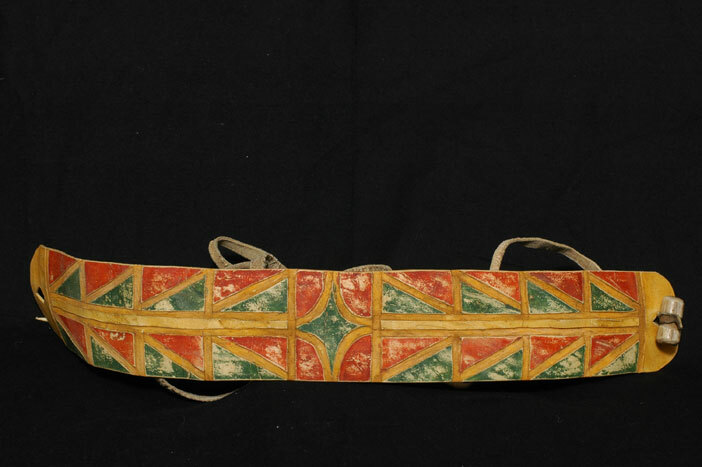 A dance belt worn by Charles Stabler, Jr. (1900-1992) and gifted to Hollis Dorion Stabler many years ago. It was gifted to Mark Awakuni-Swetland in 2004.
mónzhiha. món. 'arrow'. 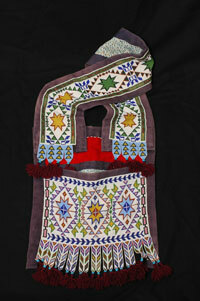 zhi from úzhi 'to contain', ha 'hide or skin', úzhiha, 'bag'. Mountain lion skin, dyed horse hair, wood, beads, wool cloth, mallard duck neck feathers, metal, sinew, turkey feathers. Adapted from an Omaha quiver in the Phoebe A. Hearst Museum of Anthropology, University of California-Berkeley. 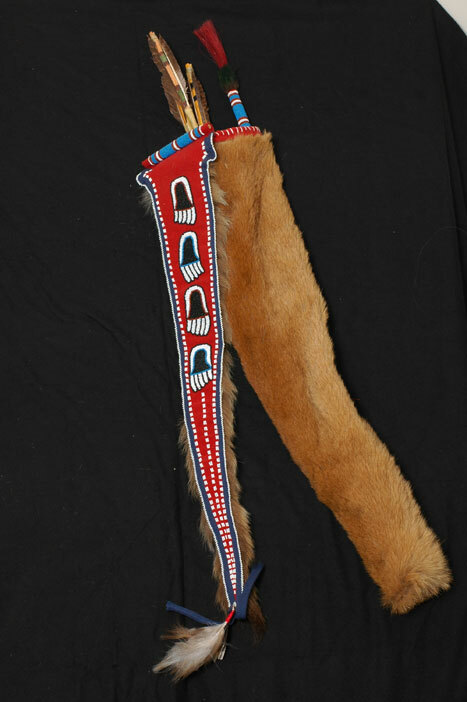 This is an embellished quiver, part of a quiver-bowcase set, that would be worn for dances and ceremony. 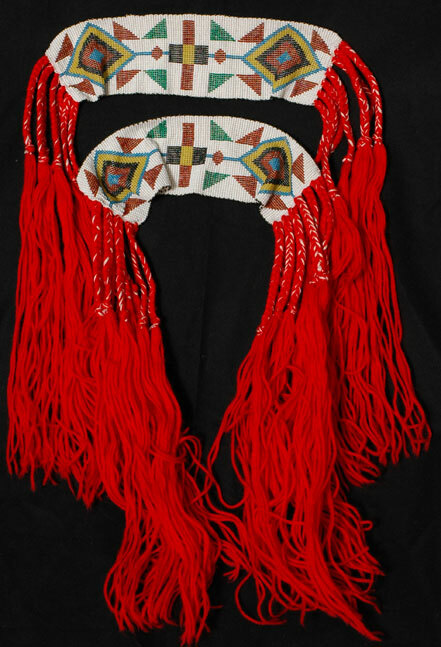 The bear paw beadwork design is derived from the beaded strips on an Omaha big shirt in the Volkerkunde Museum, Berlin, Germany. The straightening rods are beaded using concentric rings as seen on the Berkeley example. Awakuni-Swetland. tabé gasi zhon.. Shinny is called: tabé gasi. tabé 'ball', gasi, '', zhon 'stick or wood'. Wood, plastic tape, rubber. 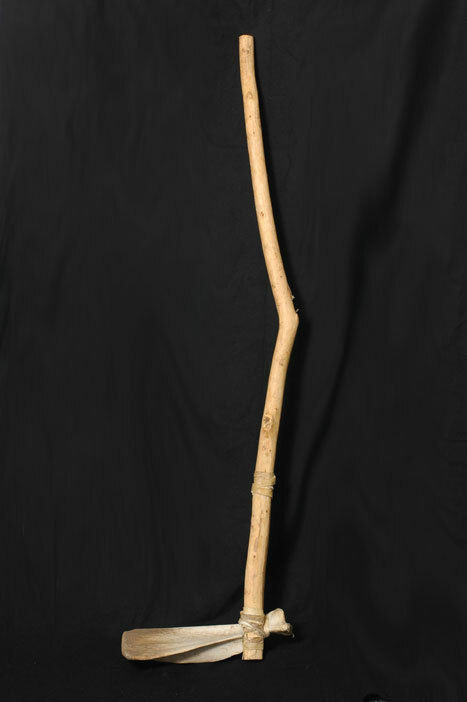 This shinny stick, possibly made from hickory, was crafted by Tom C. Walker circa 1940. He used it to play shinny on the Omaha reservation. A game similar to field hockey, two teams of men would attempt to drive a flattened circular ball through goal posts on opposite ends of a freshly cut hay meadow. 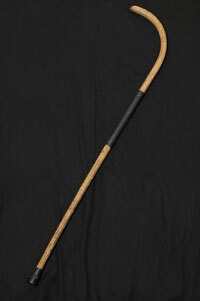 After retiring from the game, Tom C. converted the shinny stick into a cane in his later years. He gifted this shinny stick to Mark Awakuni-Swetland in 1994.
péxe wachígaxe waín. 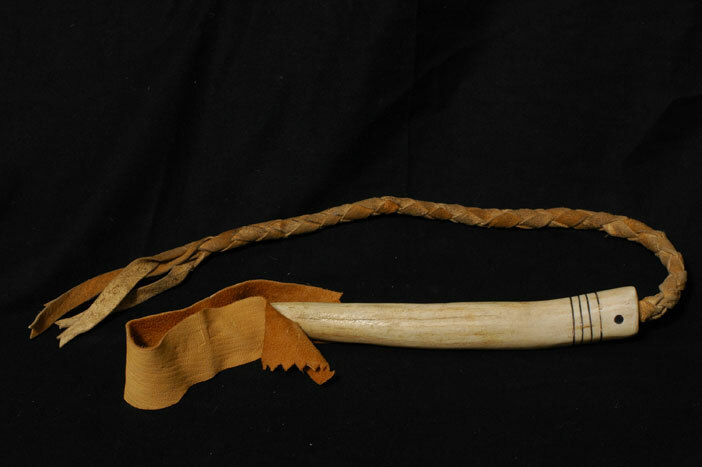 péxe 'gourd', wachígaxe 'dance', waín 'blanket'. Wool cloth, cotton binding, various medals. 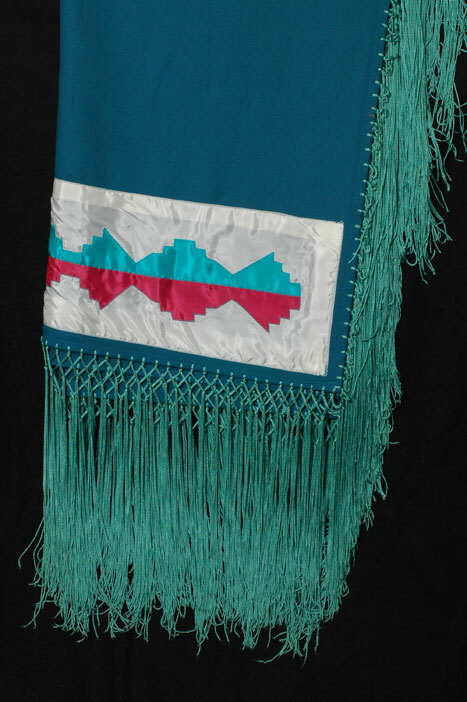 Worn by members of the Omaha Tia-Piah Society, a southern plains veteran's dance that was gifted to the Omaha people in the late 1960s from the Kiowa. Veterans often display their combat pins and other medals on the blanket. 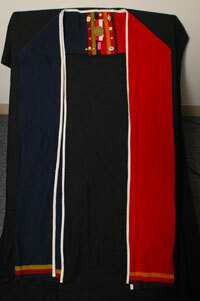 Initiated into the Omaha Tia-Piah Society in 1973, Awakuni-Swetland displays various academic medals and honors on the blanket. 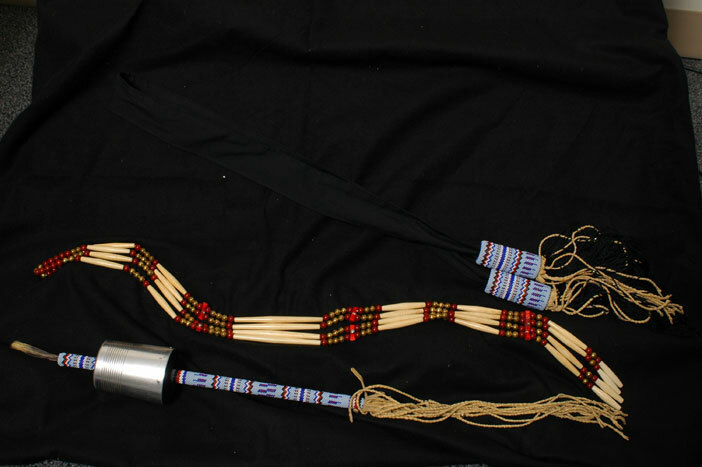 Gourd dance rattle, sash, and bandoleer. péxe, ipíthage, núsi áxthade. péxe 'gourd rattle, or mónze pexe 'metal gourd rattle', ipíthage, 'belt', núsi áxthade 'bandoleer'. Metal rattle with wooden plug, fiberglass rod covered with leather and beadwork. 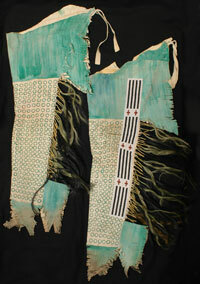 Cloth sash and fringes with beadwork over plastic cylinders. Bone hairpipe, composite beads, leather, metal studs, and imitation sinew lacing. The metal rattles used by the gourd dancers simulates the small arms fire that could be heard at a distance during a battle with federal troops. The combination of bandoleer and decorated sash replicate the saber or side-arms support captured from defeated cavalry troops. Awakuni-Swetland. péxe. péxe 'gourd rattle, or mó nze pexe 'metal gourd rattle'. 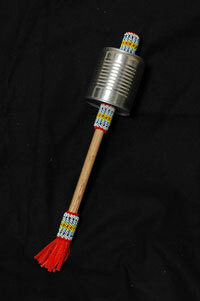 Tin can, wood rod covered with leather and beadwork. The metal rattles used by the gourd dancers simulates the small arms fire that could be heard at a distance during a battle with federal troops. Many times the rattles were fashioned from the baking powder cans issued as rations to Indians in the late 19 th century. Awakuni-Swetland. Pheasant feathers, glass beads, leather, paint. 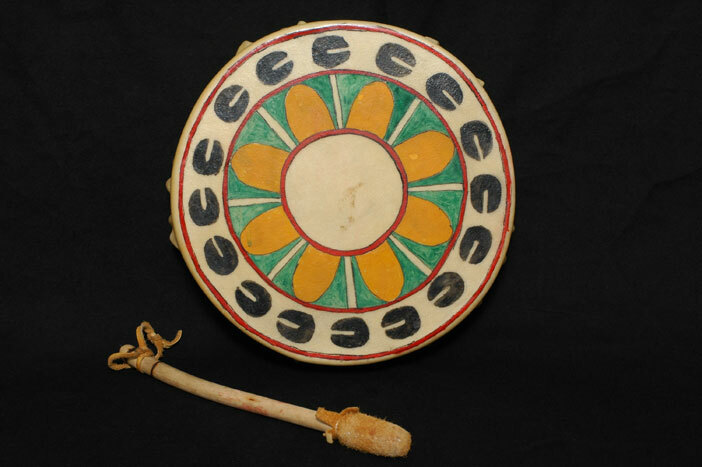 A fan used during gourd dances and other occasions. Originally made by Clyde Sleeper, Sr. and later gifted to Mark Awakuni-Swetland in the late 1970s. ínuthin. in from íne 'stone', uthín 'to strike'. Wood, leather, beads, nylon thread, deer leg bone "stones", aluminum salt shaker rattles, turkey feathers. Hand game involves participants hiding small stones, shells, or pieces of bone and challenging the opposing side to guess which combination of hands the stones are in. 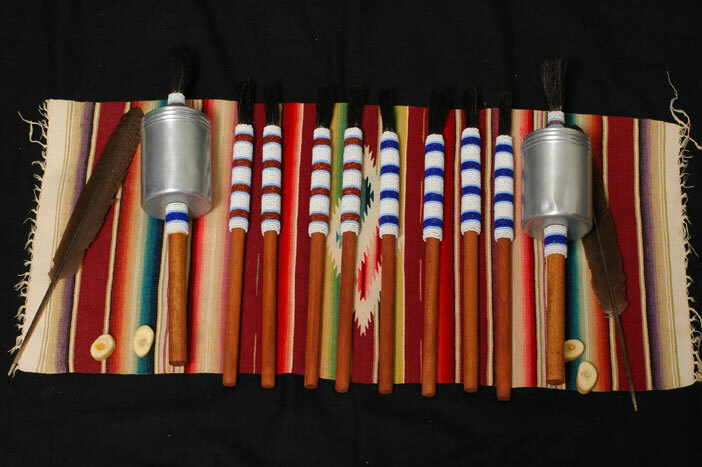 Score keepers watch the counter sticks and shake the rattle when one team has succeeded in winning all eight sticks. Two people from the losing side are given the rattles to dance with, and present a small gift back to the sponsors as penalty for losing. Teams play for a wager. While being a fast-paced social activity, there are traditional protocols and ritual observances. 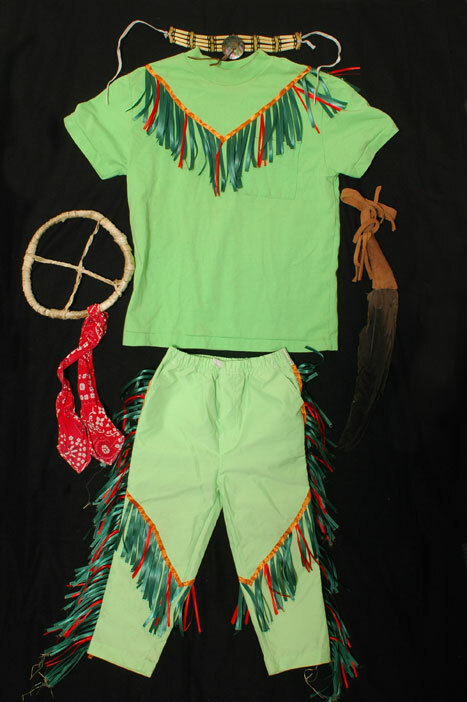 This set was created by Mark Awakuni-Swetland for use by the Macy Public School students in their Indian Culture Program in the late 1980s. The materials were chosen to withstand any accidental rough handling by the young players. 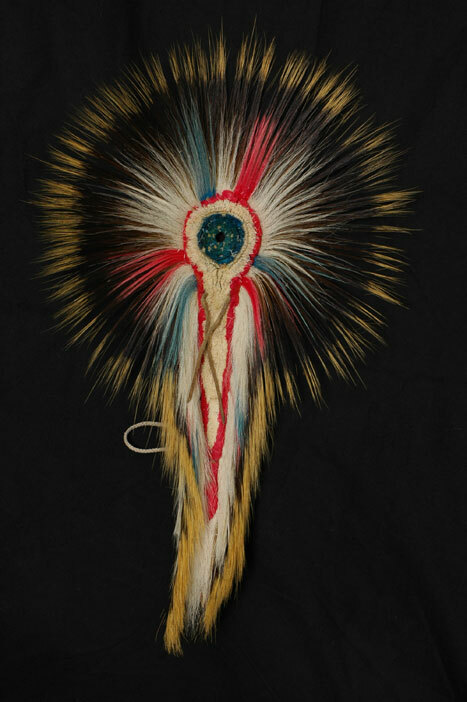 The counter sticks are beaded using concentric rings as seen on a quiver straightening rod in the collections of the Phoebe A. Hearst Museum of Anthropology, University of California-Berkeley. 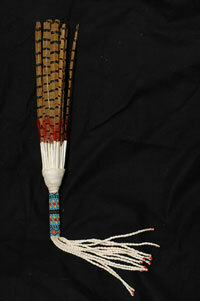 Cloth and ribbons, goose wing fan, rawhide covered willow hoop. This is a portion of a beginner's grass dance regalia crafted by Donna and Mark Awakuni-Swetland for their son, Keali'I Swetland, when he started dancing in 2005. The movement of the grass dancer reflects the motion of the winds across the grassy plains. The rawhide-covered willow hoop is part of the hoop and pole game, and represents the name of the I nkesabe (Black Shoulder Buffalo clan) Wathigizhe sub clan to which Keali'I belongs. Keali'I chose the colors. wahába ska. wahába 'an ear of corn', ska 'white'. A white mixed variety grown by Winnebago and Omaha horticulturalists. wahába zhíde. 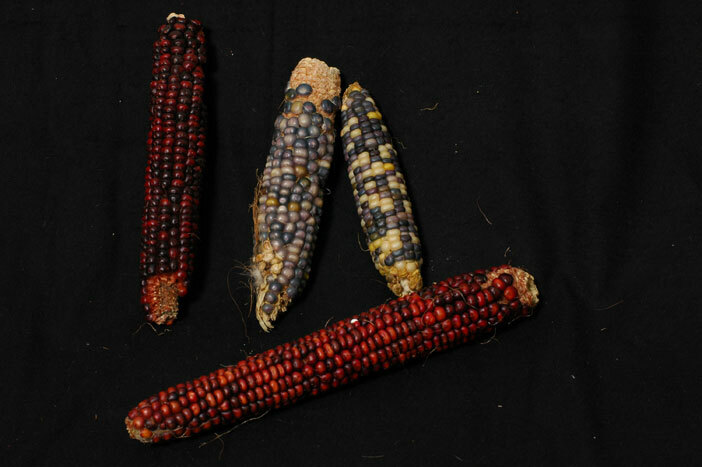 wahába 'an ear of corn', zhíde 'red'. A red-mixed variety grown by Kickapoo horticulturalists near McLoud, Oklahoma. Gifted to Micah Swetland by Albert Sanderson. Used by students during the summer 2005 Native American Horticulture Project (Indian garden). Awakuni-Swetland.